Transandino Uspallata Railway brings from the past the time when trains crossing Uspallata Valley along the Rio Mendoza after passing the tunnel under Cordilleras provided connection between Buenos Aires and Santiago. At the time of its official opening in 1910, the Trans-Andean Railway (Ferrocarril Transandino) connecting Buenos Aires on the Atlantic coast with Valparaiso on the Pacific side was raising huge expectations. Indeed after almost 20 years of construction, the railways opened new horizons for fast growing commercial and passenger traffic across the continent. To make it clear - the passenger train service from Buenos Aires to Valparaiso (in other words the trip from the Atlantic coast to the Pacific one) was taking about 36 hours including stops. However the corresponding journey by sea from Buenos Aires to Valparaiso either through the Magellan Strait or over treacherous waters around Cape Horn was taking 11 to 12 days. Indeed the new transcontinental railway was expected to be a commercial success. Unfortunately for several reasons the hopes did not materialize as planned. From the beginning the railroad was plagued by frequent avalanches, landslides, abundant snowfalls and torrential waters despite protective snow-sheds and tunnels designed over the long portion of tracks in the high mountains. As the matter of fact the disastrous flooding in 1934 destroyed more than 120 km of tracks on the Argentinean side, for years putting the whole system out of work. The relatively steep slops on both access sides to the Cumbre Tunnel (main railroad tunnel under the mountains) significantly reduced the maximum load that could be transported by trains. With time, a more convenient and faster motor-vehicle traffic overtook services provided the Trans-Andean railway. The Cumbre Tunnel gradually started to share cars and trains (quite a nightmare from the logistical point of view given its length and narrowness). Opening the modern RN-7 with a new road tunnel (Cristo Redentor de los Andes) definitely sealed the destiny of the Trans-Andean Railway. 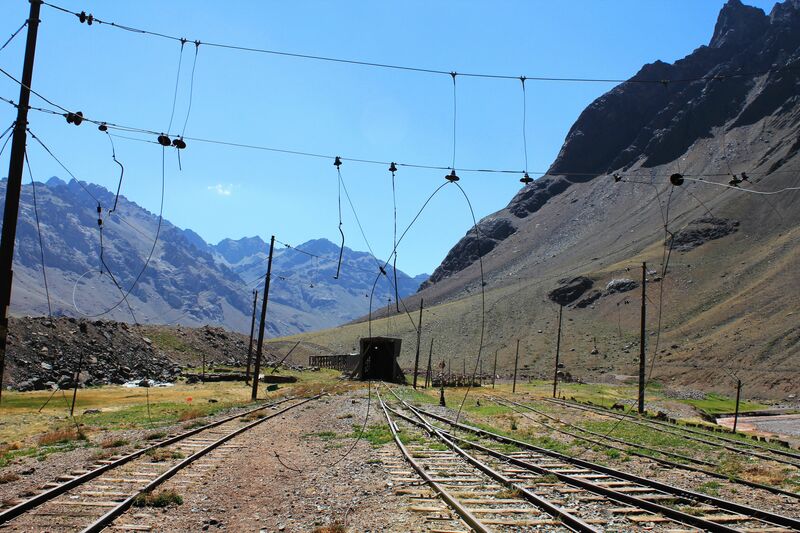 The last train freight crossed the Andes in 1984. Certainly the Ferrocarril Trasandino was never a commercial success. However its “adventurous” part mystified by countless true and not-so stories and magnified by the extraordinary landscape and generously rich palette of colors of High Andes is still alive and actually on the verge of revival. Since few years both governments are discussing the feasibility and economical aspects of re-opening this historical railroad. Undoubtedly it will require a major re-work, especially on the Argentinean side where the large part of the tracks is in a “state of sorry”…(if it is at all!). But surely, the positive decision will be highly appreciated and loudly applauded by the community of tourists. Honestly, there is nothing more enchanting and romantic than a “voyage” to the past…..
Last station on the Argentinean side in Las Cuevas. 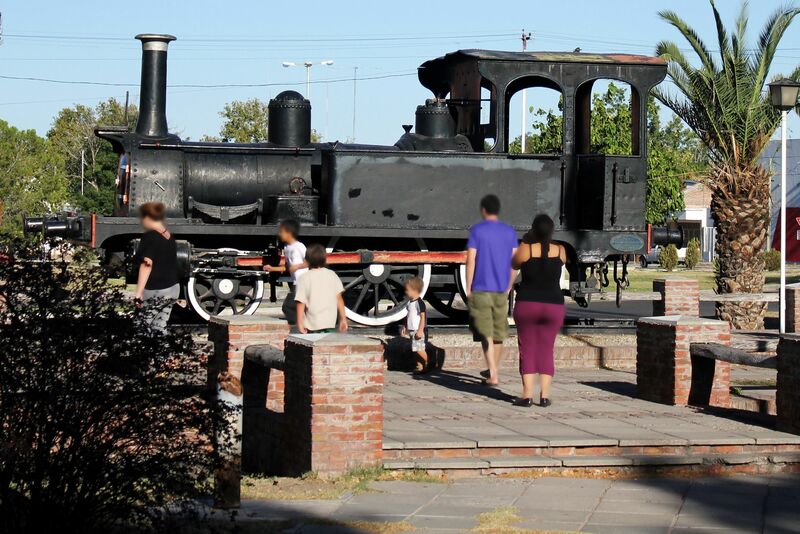 center: One of only few segments of railroad tracks in still relatively good shape on the Argentina side. Railway station at Puente del Inca was certainly busy at the time of glory of the famous Thermal Spa. Late evening sky matches the palette of colors displayed all along the Uspallata Valley in High Cordilleras. 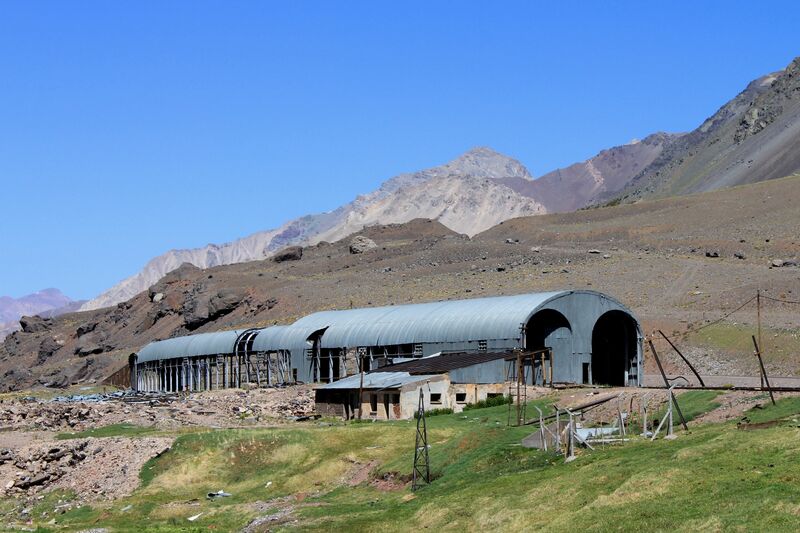 I'm sure that you enjoyed this Andean Adventure on the road from Mendoza to Santiago (actually to the border "town" Las Cuevas). All along the Uspallata Valley you were able to witness the incredible beauty of nature. You were able to admire the vibrant and colorful life finding its way in this rather unfriendly landscape and climate. You were certainly amazed by the remarkable spectacle of shapes in full rainbow of colors. Yes, this part of High Andes so graciously combined the raw, imposing power of rocky mountainous ranges with vibrant forms of life. I hope that one day you will have chance to personally experience a joy of High Andes Adventure, here proposed by the virtual tour with pictures presented by Transandino Uspallata Railway Free Pictures and all previous pages.